I've been working to put together another blog that will be based on ideas to eliminate many personal expenses and make money in non-tradition ways in order to lower your tax burden without starving or going to prison. Having settled on some variation of "Live Free or Die" as a title to maintain an Anarchist theme, I was searching for images to use on the blog when I came across a bit of ever-present Government logic. You can read the full case here, but I'll give a short summary so you don't have to wade through all that. 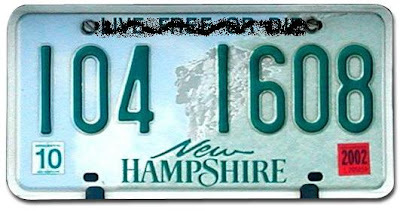 Back in 1974, a Jehovah's Witness named George Maynard decided that the New Hampshire state motto, "Live Free or Die," contradicted his religious beliefs and began covering it up on his license plates. Not long after, one of the loyal servants of the State of New Hampshire cited Maynard for violating the state statute against altering license plates. In spite of the court's sympathy with his stance, Maynard was given a fine that was suspended as long as he behaved himself from now on. Maynard was soon cited a second and third time and ended up serving 15 days in jail after refusing to pay the fines, as well as being given a six month suspended sentence. Subsequently, Maynard successfully sued in federal court to have his conviction overturned on First Amendment grounds of freedom of speech and religious freedom. But that wasn't the end of the story. New Hampshire was so determined to enforce freedom (or death) upon George Maynard that they appealed the case all the way to the Supreme Court. To their credit, the Supreme Court upheld the earlier decision by a 6-3 vote. However, the fact that the State of New Hampshire couldn't recognize the obvious irony of jailing someone for not displaying a slogan advocating freedom even at the cost of one's own life amazes me. My brother in law alledgedly got ticketed once for changing the "ski Utah" on his license plate to "Skip Utah" for the same reason; altering it. Not only is that funny, it's solid advice.